Hot air balloons, golf, camping Camp sites are not usually associated with historic sea side towns. But Belhaven, NC has that and more. Belhaven has been the trade center for this part of the Inner Banks as well. The area is also home to the Pungo District Hospital. All of these attributes are in addition to the world class fishing and hunting opportunities. 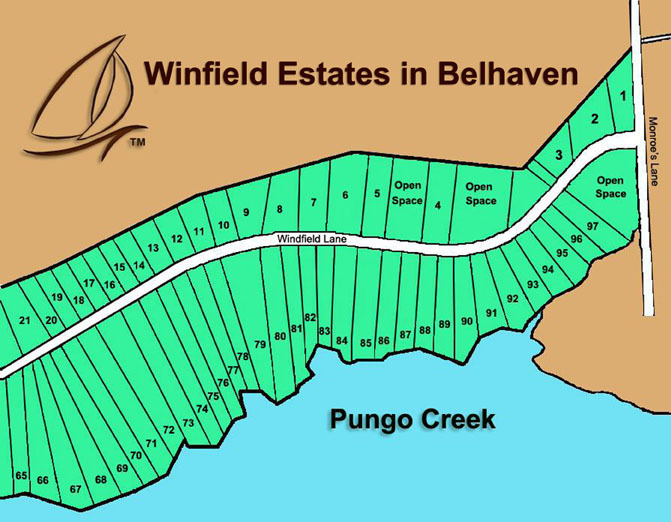 Winfield Estates is located right by Belhaven on the Pungo River. It is a community offering both waterfront and water access homesites. It has a common area with boat ramp. Other amenities include underground utilities, paved roads, a mixture of wooded and open lots, county water and private septic. The properties we represent at Winfield Estates are a participant in the Inner Banks Living submarket pricing of waterfront properties.